This is a guest post, by Bruce Sharp. The post first appeared on Linkedin. The big energy splash in the Ontario Government’s September 12 throne speech was rebating the provincial portion of the HST to certain electricity users. This group will include mainly voters and is estimated to cost about $ 1 billion per year, with the cost being born by provincial taxpayers. In a September 14 Linkedin post, I commented on the merits of the move. Another electricity move announced that same day was the expansion of the Industrial Conservation Initiative (ICI), otherwise known as the Global Adjustment (GA) Class A.
Ontario’s GA is the electricity market mechanism for collecting and allocating above-market generation and conservation and demand management costs. Prior to 2011, there was a single GA class, with all consumers paying for GA costs based on a uniform, postage-stamp rate. Starting in 2011, we had two classes: A and B, with the classes’ shares of GA costs determined in different ways. This program did not initially have a name but at some point was dubbed the Industrial Conservation Initiative. Class A now pays significantly less than they would have, had we still had one GA class. The result is a transfer of costs from Class A to Class B, i.e. a cost decrease for Class A’s mostly large industrial consumers and a cost increase for Class B -- residential and most other Ontario electricity consumers. In an April 14 Linkedin post, I provided an update on that cost transfer. Given the recent news, I thought I’d provide another update, estimate the additional transfer that will occur as a result of the expansion of Class A and look at the economics of the initiative. For the period of October 2015 through September 2016, total GA costs were $12.1 billion. If there had still been a single GA class, the uniform rate would have been $ 86.20/MWh. With the two classes, there was a cost transfer from Class A to B of $ 940 million. Class A paid an average of $ 52.50/MWh or 39% less than they would have had we still had a single GA class. Class B -- by virtue of its larger total energy consumption -- paid $ 94.60/MWh or 9.7% more. For the residential consumer with losses-inclusive, annual consumption of 9.5 MWh, that represents an added cost (inclusive of HST) of $ 90/year. The result will be an additional cost transfer – from the new Class A consumers to the remaining Class B consumers. Assuming 2/3 of newly-eligible consumers move from Class B to Class A and making a few more assumptions, I estimate the additional cost transfer at $ 275 million per year. The economics of the ICI can be looked at in two ways: the value of the demand response provided by Class A consumers and the price signal they see. By either metric, they can be judged against the cost of the generation alternative: a simple cycle gas turbine (SCGT) plant with a liberal (i.e. high) cost of $ 175,000 per MW per year. The current Class A cohort is estimated to provide 700 – 1,000 MW of demand response. 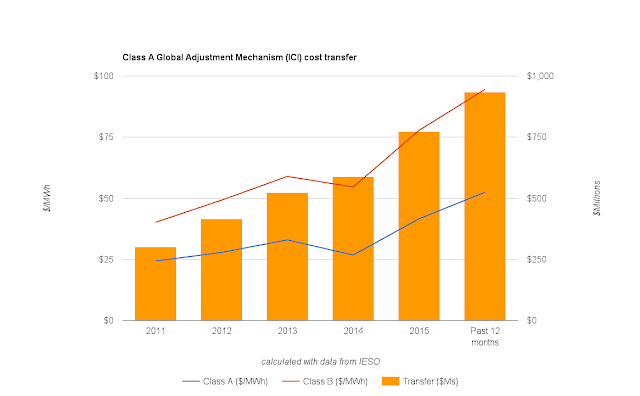 Taking the cost transfer from Class A to Class B of $ 940 million as the annual cost, the unit rate cost is $ 940,000 to $ 1,340,000 per MW per year. This compares quite unfavourably with the generation alternative – ringing in at 5.4 to 7.7 times as much as the SCGT alternative. The value for the new Class A cohort will be even worse. Anecdotal evidence suggests this group will provide an additional demand response of only 100 MW. Taking the additional cost transfer of $ 275 million as the annual cost, the unit rate cost is $ 2,750,000 per MW per year. This is an astronomical 16 times as much as the SCGT alternative. With annual GA costs of $ 12.1 billion and the average provincial peak used for GA purposes running at approximately 23,000 MW, a Class A consumer dropping 1 MW of net load (via a gross load reduction of 1 MW or behind-the-meter generation of 1 MW) will derive a benefit of about $ 530,000 – about 3 times as much as the SCGT alternative. This means there’s a lot of incentive for Class A to manage their load and in so doing, pursue measures that would not be economic from a system perspective. Questionable policy shouldn’t put off current or potential GA Class A consumers from making the most of the ICI. Clearly, the demand response provided by Class A is not economic and the price signal is well out of step with the generation alternative. So attempting to justify its existence based on either economic metric is not at all valid. Instead, the government should acknowledge that the Industrial Conservation Incentive is a pure industrial policy play. This happens in Germany, where the EEG (Erneuerbare Energien Gesetz – the green equivalent of our GA) surcharge is paid for almost exclusively by residential and small business consumers. The ICI should also be completely transparent. After stonewalling for a number of years, Ontario’s Independent Electricity System Operator (“IESO”) finally this summer began publishing the information required to calculate this cost transfer. They should go further by calculating and posting the cost transfer for all to see. If you have questions about this and would like to know more, answers are available. You may have questions about whether or not you should decide to be in the GA Class A or B or how and what the economics are of lowering your GA Class A costs. For more information, please send me a Linkedin message or email me at bruce@brucesharpenergy.com. Sure it's a guest post, but on this blog readers should expect a graphic. The growing impact of the ICI/Class A global adjustment mechanism.